It’s so simple to say that Ohannes Akkirayian has been in the motor vehicle restoration business for 43 years. While it is of course true, Ohannes has restored classic cars on 4 different continents. After leaving his native Europe Ohannes set off to work in the US where he gained valuable experience in the infant older car scene. Then in 1969 Ohannes travelled south to Argentina where he found himself very busy, but while the cars were older he could describe them as being on the collectable side. However as spares were hard to obtain he hand made what was required. December 1976 saw Ohannes and Sylvia in Australia but 3 years later his expertise was again in demand in the US and Argentina. However they liked what they had seen in Australia and returned in 1981. 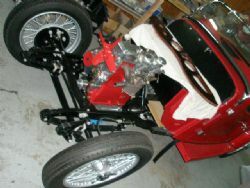 To many Australian classic car owners the name of Classic Autocraft has significant meaning, as the Sydney based company was known to produce that crème de la crème of motor vehicle restoration work. Ohannes knew his work was second to none and he soon found himself at Classic Autocraft. 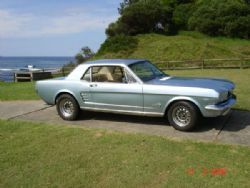 Some 6 ½ years later it was time to set up for himself and he and Sylvia formed O&S Sports Car Restoration at Dee Why in Sydney’s northern beaches. Since relocating to the nearby suburb of Cromer, O&S Sports Car Restoration offers a complete restoration service for all categories of motor vehicles. Ohannes is quick to point out that his company is very much a family business as not only is Sylvia there on a daily basis but son Ariel has now joined the business. 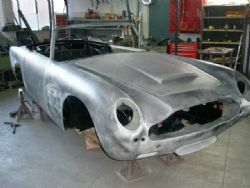 As you would imagine O&S Sports Car Restoration is fully prepared to hand form panels for the rarest of classic vehicles. Equipped with everything from rolling, folding and swaging machines right through to a fully operational spray booth, Ohannes can turn your past beauty into a concours winner. About the only role not undertaken is engine machining and specialist trimming trusted to Alders Engineering and Gary Penning respectively. All rebuilding of mechanical components is undertaken in-house with Ohannes’ experience providing peace of mind for vehicle owners. Ohannes said that almost all his customers prefer their cars restored as close to original as possible and he is very infrequently called upon to undertake modifications. When we visited O&S Sports Car Restoration we were enthralled at a complete restoration underway on a gorgeous 1932 Singer. 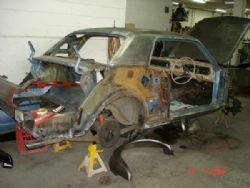 Its fastidious owner wanted nothing but the best which meant that any restoration had to be back to the bare chassis. So that’s exactly what Ohannes did with the chassis sand blasted in preparation for painting. All the suspension components were similarly treated in-house. As happens various components were passed saving, meaning that Ohannes hand formed the sweeping running boards and door skins. Almost every other panel also needed extensive repairs and all mechanicals have also been restored in-house. At the other end of the spectrum were a Ford Mustang, Jaguar E-type, Aston Martin DB4 and Porsche 356 in various stages of restoration. The owners of each of these post WW2 vehicles wanted their cars restored to better than showroom condition and from our observations that is what they are receiving. The Mustang in particular certainly needed Ohannes’ tender care as its body was infested with a significant amount of the dreaded rust worm. Now coming to the end of its restoration it required extensive repairs to the four guards, cockpit floor, boot floor and each of the corners where in its past life it had received less than satisfactory accident repair. However don’t take our word for it – give Ohannes a call. Better still pay O&S Sports Car Restoration a visit and later have a chat with previous satisfied customers, as there is no better recommendation.